Julia has been reading "The Rise And Fall Of Mount Majestic" to the littles for some time now, and today was the end of it. Brothers: Stan Lee, James and Joe. We are so happy to have James, Abbie and Kerian all back home again. It is always such a joy to welcome a new little member into the family. He is such a friendly, smiling, happy-all-the-time little fella. 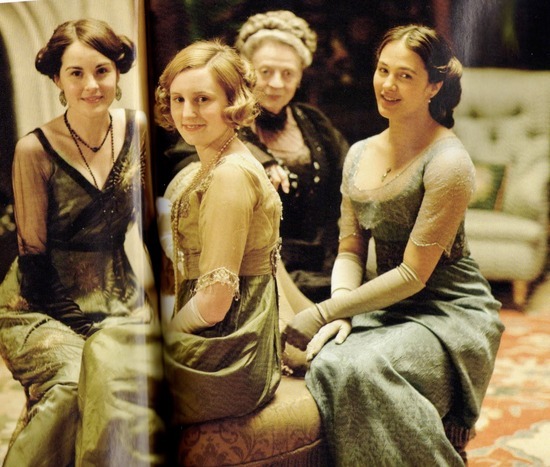 Lately we ladies of the family have been enjoying Downton Abbey, and following the adventures of upstairs and down. The is nothing that can compare to some good British Costume drama! The music, the costumes, the cast, the scenery, and the story, all so wonderfully intricate and relaxing. "Reflect upon your present blessings, of which every man has many--not on your past misfortunes, of which all men have some." "O Lord, thou Lover of Souls, open our eyes to see Thy love for us. Grant that we may face all difficult and lonely places in our lives, strong in the knowledge of that love. May the divine fire of Thy understanding, inspiring, unweariable love enkindle our hearts till every detail of our daily lives shall be so warmed and gladdened thereby, that it may become the work of our lives to obey Thee, and the joy of our souls to please Thee; through Christ our Saviour." ::The Rabbit Room: "What Is Love?". i very much enjoy reading your blog and seeing the pictures of your beautiful family! i can tell that you like to sew and i was wondering if you make your own clothes. i especially like the jumpers and skirts that i see in your pictures. Can you share the patterns that you use? thanks, and God bless you all. I have been designing aprons for the last two days and cut fabric today. It is fun to see yours! Will you have photos of the new baby, Kieran? I'd love to have a peek. It must have been nice for Abbie to see her family in Norway. She is a lovely Christian wife and mother. I remember always being led to her blog to read her beautiful writings~so Bible and Christ centered. She and your brother must be enjoying their baby! What a blessing for them both. Your apron is very nice. I like the button in the back, too. Would you think about giving us a tutorial on how you make your criss cross aprons? My girls would love to sew some up. We only have the pattern for the tie aprons. I have not been able to log into my blog (Goodwiferose)I had to change the password and now I have forgotten it. Enjoy your day! Dear Rosie, I enjoy visiting your blog so much. The picture of Julia reading with the toys scattered, blesses this busy mama. It's so nice to see other home centered families living it out and it is an encouragement. My husband, daughter and I love Downton Abbey. What a treat to have it slowly revealed week by week. I watched a part of an episode of Downtown Abby once in a hotel. I do like that style of movie! Your new apron is lovely. lovely pictures as usual, your family are all grwing up so quickly. looking forward to seeing some of the new addition! i also love downton abbey, in fact any period dramas. have just finished watching dvd bleak house. have you seen it? i was wondering do you have tv in your house or do you watch things via computer? I love Downton too - we all live just like that here in England! Haha! I've just noticed that your URL is Sherwood forest - I live about an hour away from Robin Hood's Sherwood forest, and there are some very ancient trees there, a special place. There is a fascinating new book: Lady Almina and the Real Downton Abbey by Fiona Carnarvon, the current Countess of Highclere which is the estate where Downton is filmed and the house/people that the series is based on. Since you like to read, I think you'd probably like it. Beautiful new apron! We love an English period drama around here too. I hadn't heard of that book, but will check it out - we are always on the look out for good read-alouds! Love to Aslaug, James and Keiran! Love to you gals and your Momma, too! Oh, and Sam. And Stan Lee...okay, just give everyone our love! Rose, I will see what I can do, to post an apron tutorial, quite a few people have asked for one! We have watched all the way to though season two, and are waiting to watch the Christmas Special! I t is so good, isn't it? You really will have to give Downton Abbey a try, it is so good! We watch things on the computer, as we don't have a tv, only a vcr. Theresa, you are right, I am going to have to read that, thanks so much! It sounds like something I would really enjoy! Anna, I have to agree with you, that is my favorite version!